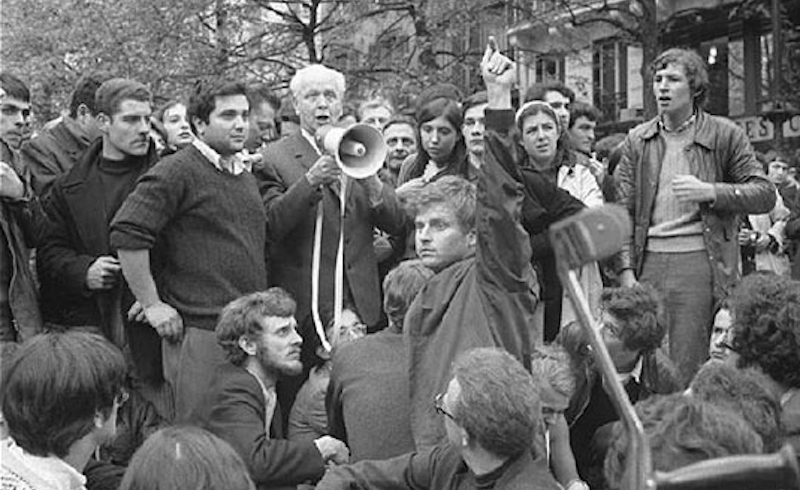 Daniel Cohn-Bendit raises his arm to allow Louis Aragon to speak, May 1968. Photo: Serge Hambourg. via Flickr. This conversation between Jean-Paul Sartre and Daniel Cohn-Bendit was first published in Le nouvel observateur on May 20, 1968. The translation, by B.R. Brewster, was collected in The Student Revolt: The Activists Speak (Panther Books, London:1968), edited by Hervé Bourges. It was previously published online at Medium. Jean-Paul Sartre: Within a few days, although no-one called for a general strike, France has been practically paralysed by work stoppages and factory occupations. And all because the students took control of the streets in the Latin Quarter. What is your analysis of the movement you have unleashed? How far can it go? Daniel Cohn-Bendit: It has grown much larger than we could have foreseen at the start. The aim is now the overthrow of the regime. But it is not up to us whether or not this is achieved. If the Communist Party, the CGT and the other union headquarters shared it there would be no problem; the regime would fall within a fortnight, as it has no counterthrust against a trial of strength supported by all working-class forces. J.P-S.: For the moment there is an obvious disproportion between the massive nature of the strike movement, which does, indeed, make possible a direct confrontation with the regime, and the demands the trade unions have presented which are still limited ones: for wages, work organization, pensions, etc., etc. D.C.-B. : There has always been a disjunction in workers’ struggles between the strength of the action and the initial demands. But it might be that the success of the action, the dynamism of the movement could alter the nature of the demands progressively. A strike launched for a partial victory may change into a movement for insurrection. Even so, some of the demands put forward by the workers today are very far-reaching: a real forty-hour week, for example, and at Renault’s a minimum wage of a thousand francs per month. The Gaullist regime cannot accept them without a total loss of face and if it holds out, then there will be a confrontation. Suppose the workers hold out too and the regime falls. What will happen then? The left will come to power. Everything will then depend on what it does. If it really changes the system — I must admit I doubt if it will — it will have an audience, and all will be well. But if we have a Wilson-style government, with or without the Communists, which only proposes minor reforms and adjustments, then the extreme left will regain its strength and we shall have to go on posing the real problems of social control, workers’ power, and so on. But we have not reached that stage yet, and it is not at all certain even that the regime will fall. J.-P.S. : When the situation is a revolutionary one, a movement like your own may not be stopped, but it may be that its impetus will fade. In that case you will have to try to go as far as possible before you come to a halt. What irreversible results do you think the present movement will achieve, supposing that it soon stops? D.C.-B. : The workers will obtain the satisfaction of a number of material demands, and the moderates in the student movement and the teachers will put through important university reforms. These will not be the radical reforms we should like to see, but we shall still be able to bring some pressure to bear: we shall make particular proposals, and no doubt a few of them will be accepted because they won’t dare refuse us everything. That will be some progress, of course, but nothing basic will have changed and we shall continue to challenge the system as a whole. Besides, I don’t believe the revolution is possible overnight like that. I believe that all we can get are successive adjustments of more or less importance, but these adjustments can only be imposed by revolutionary action. That is how the student movement, which, even if it does temporarily lose its energy, will still have achieved an important university reform, can act as an example to many young workers. By using the traditional means of action of the workers’ movement — strikes, occupations of the streets and workplaces — we have destroyed the first barrier: the myth that "nothing can be done about the regime." We have proved that this is not true. And the workers rushed into the breach. Perhaps this time they won’t go right to the end. But there will be other explosions later on. What matters is that the effectiveness of revolutionary methods has been proved. The union of workers and students can only be achieved in the dynamic action if the students’ movement and the workers’ movement each sustain their own impetus and converge on one aim. At the moment, naturally and understandably enough, the workers distrust the students. J.-P.S. : This distrust is not natural, it has been acquired. It did not exist at the beginning of the nineteenth century, and did not appear until after the massacres of June 1848. Before that, republicans — who were intellectuals and petty bourgeois — and workers marched together. This unity has been out of the question ever since, even in the Communist Party, which has always carefully separated workers and intellectual. D.C.-B. : But something did happen during the crisis. At Billancourt the workers would not let the students into the factories. But even the fact that students went to Billancourt was new and important. In fact, there were three stages. First, open mistrust, not only in the working-class press, but among the workers themselves. They said, "Who are all these daddies’ boys who have come here to annoys us?" Then, after the street battles, the students’ struggle with the police, this feeling disappeared and solidarity was effectively achieved. Now we are in a third stage: the workers and peasants have entered the struggle in their turn, but they tell us, "Wait a little, we want to fight our own battles for ourselves!" That is to be expected. Union can only take place later on if the two movements, the students’ movement and the workers’ movement, maintain their impetus. After fifty years of distrust, I don’t think that what is called "dialogue" is possible. It is not just a matter of talk. We should not expect the workers to welcome us with open warms. Contact will only be made when we are fighting side by side. We might for example set up common revolutionary action groups in which workers and students raise problems and act together. There are places where that will work, and others where it won’t. J.-P.S. : The problem remains the same: adjustments or revolution. As you have said, everything you do by force is recovered positively by the reformists. Thanks to your action, the university will be readjusted, but only within the framework of a bourgeois society. D.C.-B. : Obviously, but I believe that that is the only way to advance. Take the examinations, for example. There can be no doubt that they will take place. But certainly not in the way they used to. A new formula will be found. And once they take place in an unusual way, an irreversible process of reforms will have been set moving. I don’t know how far it will go, and I know it will be a slow proves, but it is the only possible strategy. I am not interested in metaphysics, in looking for ways to "make the revolution." As I have said, I think that we are moving towards a perpetually changing society, modified by revolutionary actions at each stage. A radical change in the structure of our society would only be possible, if, for example, a serious economic crisis, the action of a powerful workers’ movement, and vigorous student activity suddenly converged. These conditions have not all been realized today. At best we can hope to bring down the government. We must not dream of destroying bourgeois society. That does not mean that there is nothing to be done; on the contrary, we must struggle step by step, on the basis of a global challenge. I am not really interested in whether there can still be revolutions in advanced capitalist societies, and what we should do to induce them. Everyone has his own theory. Some say: the revolutions of the Third World will bring about a collapse of the capitalist world. Others: only thanks to revolution in the capitalist world can the Third World advance. All these analyses are more or less correct, but, to my mind, of little importance. Look at what has just happened. Many people spent a long time searching for the best way to set off an explosion among the students. Finally — no one found it — an objective situation produced the explosion. There was the authorities’ coup de pouce, of course — the police occupation of the Sorbonne — but it is clear that that absurd mistake was not the sole source of the movement. The police had already entered Nanterre several months earlier without setting off a chain reaction. This time there was a chain reaction that could not be stopped — which allows us to analyse the role an active minority can play. What has happened in the last fortnight is to my mind a refutation of the famous theory of the "revolutionary vanguard" as the force leading the popular movement. At Nanterre and Paris there was simply an objective situation, arising from what is vaguely called "student unrest" and from a desire for action on the part of some young people disgusted by the inaction of the ruling classes. Because it was more conscious theoretically and better prepared, the active minority was able to light the fuse and make the breach. But that is all. The others could follow or not. They happened to have followed. But from then on no vanguard, neither the UEC, the JCR nor the Marxists-Leninists, has been able to seize control of the movement. Their militants can participate decisively in the actions, but they have been drowned in the movement. They are to be found on the co-ordination committees, where their role is important, but there has never been any question of one of these vanguards taking a leading position. This is the essential point. It shows that we must abandon the theory of the "leading vanguard" and replace it by a much simpler and more honest one of the active minority functioning as a permanent leaven, pushing for action without ever leading it. In fact, though no one will admit it, the Bolshevik Party did not "lead" the Russian Revolution. It was borne along by the masses. It might have elaborated its theory en route, and pushed the movement in one direction or another, but it did not by itself launch the movement; that was largely spontaneous. In certain objective situations — with the help of an active minority — spontaneity can find its old place in the social movement. Spontaneity makes possible the forward drive, not the orders of a leading group. J.-P.S. : What many people cannot understand is the fact that you have not tried to work out a programme, or to give your movement a structure. They attack you for trying to "smash everything" without knowing — or at any rate saying — what you would like to put in place of what you demolish. D.C.-B. : Naturally! Everyone would be reassured, particularly Pompidou, if we set up a party and announced, "All these people here are ours now. Here are our aims and this is how we are going to attain them." They would know who they were dealing with and how to counter them. They would no longer have to face "anarchy," "disorder," "uncontrollable effervescence." Our movement’s strength is precisely that it is based on an "uncontrollable" spontaneity, that it gives an impetus without trying to canalize it or use the action it has unleashed to its own profit. There are clearly two solutions open to us today. The first would be to bring together half a dozen people with political experience, ask them to formulate some convincing immediate demands, and say, "Here is the student movement’s position, do what you like with it!" That is the bad solution. The second is to try and give an understanding of the situation not to the totality of the students nor even to the totality of demonstrators, but to a large number of them. To do so we must avoid building an organization immediately, or defining a programme; that would inevitably paralyze us. The movement’s only chance is the disorder that lets men speak freely, and that can result in a form of self-organization. For example, we should now give up mass-spectacular meetings and turn to the formation of work and action groups. That is what we are trying to do at Nanterre. But now that speech has been suddenly freed in Paris, it is essential first of all that people should express themselves. They say confused, vague things and they are often uninteresting things too, for they have been said a hundred times before, but when they have finished, this allows them to ask, "So what?" This is what matters, that the largest possible number of students say "So what?" Only then can a programme and a structure be discussed. To ask us today, "What are you going to do about the examinations?" is wish to drown the fish, to sabotage the movement and interrupt its dynamic. The examinations will take place and we shall make proposals, but give us time. First we must discuss, reflect, seek new formulae. We shall find them. But not today. J.-P.S. : You have said that the student movement is now on the crest of a wave. But the vacation is coming, and with it a deceleration, probably a retreat. The government will take the opportunity to put through reforms. It will invite students to participate and many will accept, saying either "Reformism is all we want," or "It is only reformism, but it is better than nothing, and we have obtained it by force." So you will have a transformed university, but the changes may be merely superficial ones, dealing particularly with the development of material facilities, lodgings, university restaurants. These things would make no basic changes in the system. They are demands that the authorities could satisfy without bringing the regime into question. Do you think that you could obtain any "adjustments" that would really introduce revolutionary elements into the bourgeois university — for example, that would make the education given at the university contradictory to the basic function of the university in the present regime: the training of cadres who are well integrated into the system? D.C.-B. : First, purely material demands may have a revolutionary concept. On university restaurants we have a demand which is basic. We demand their abolition as university restaurants. They must become youth restaurants in which all young people, whether students or not, can ear for one franc forty. No one can reject this demand: if young workers are working during the day, there seems no reason why they should not dine for one franc forty in the evening. Similarly with the Cités Universitaires. There are many young workers and apprentices who would rather live away from their parents but who cannot take a room because that would cost them 30,000 francs per month; let us welcome them to the Cités, where the rent is from 9,000 to 10,000 francs per month. And let the well-to-do students in law and sciences-po go elsewhere. Basically, I don’t think that any reforms the government might make would be enough to demobilize the students. There obviously will be a retreat during the vacation, but they will not "break" the movement. Some will say, "We have lost our chance," without any attempt to explain what has happened. Other will say, "The situation is not yet ripe." But many militants will realize that we must capitalize on what has just taken place, analyse it theoretically and prepare to resume our action next term. For there will be an explosion then, whatever the government’s reforms. And the experience of disorderly, unintentional, authority-provoked action we have just been through will enable us to make any action launched in the autumn more effective. The vacation will enable students to come to terms with the disarray they showed during the fortnight’s crisis, and to think about what they want to do and can do. As to the possibility of making education given at the university a "counter-education" manufacturing not-well integrated cadres but revolutionaries, I am afraid that that seems to me a somewhat idealistic hope. Even a reformed bourgeois education will still manufacture bourgeois cadres. People will be caught in the wheels of the system. At best they will become members of the bien-pensant left, but objectively they will remain cogs ensuring the functioning of society. Our aim is to pursue successfully a "parallel education" which will be technical and ideological. We must launch a university ourselves, on a completely new basis, even if it only lasts a few weeks. We shall call on left-wing and extreme left-wing teachers who are prepared to work with us in seminars and assist us with their knowledge — renouncing their "professional" status — in the investigations which we shall undertake. In all faculties we shall open seminars — not lecture courses, obviously — on the problems of the workers’ movement, on the use of technology in the interests of man, on the possibilities opened up by automation. And all this not from a theoretical viewpoint (every sociological study today opens with the words "Technology must be made to serve man’s interests"), but by posing concrete problems. Obviously this education will go in the opposite direction to the education provided by the system and the experiment could not last long; the system would quickly react and the movement give way. But what matters is not working out a reform of capitalist society, but launching an experiment that completely breaks with that society, an experiment that will not last, but which allows a glimpse of a possibility: something which is revealed for a moment and then vanishes. But that is enough to prove that something could exist. We do not hope to make some kind of socialist university in our society, for we know that the function of the university will stay the same so long as the system is unchanged as a whole. But we believe that there can be moments of rupture in the system’s cohesion and that is possible to profit by them to open breaches in it. J.-P.S. : That presupposes the permanent existence of an "anti-institutional" movement preventing the student forces from structuring themselves. In fact, you could attack UNEF for being a trade union, that is, a necessarily sclerosed institution. D.C.-B. : We attack it primarily for its inability to make any demands because of its forms of organization. Besides, the defence of the students’ interests is something very problematic. What are the "interests"? They do not constitute class. Workers and peasants form social classes and have objective interests. Their demands are clear and they are addressed to the management and to the government of the bourgeoisie. But the students? Who are their "oppressors," if not the system as a whole? J.-P.S. : Indeed, students are not a class. They are defined by age and a relation to knowledge. By definition, a student is someone who must one day cease to be a student in any society, even the society of our dreams. D.C.-B. : That is precisely what we must change. In the present system, they say: there are those who work and those who study. And we are stuck with a social division of labour, however intelligent. But we can imagine another system where everyone will work at the tasks of production — reduced to a minimum thanks to technical progress — and everyone will still be able to pursue his studies at the same time: the system of simultaneous productive work and study. Obviously, there would be special cases; very advanced mathematics or medicine cannot be taken up while exercising another activity at the same time. Uniform rules cannot be laid down. But the basic principle must be changed. To start with we must reject the distinction between student and worker. Of course, all this is not immediately foreseeable, but something has begun and must necessarily keep going.